The MPK49 is well-thought-out, packed with features and an absolute breeze to work with. Genuine MPC pads. Good layout. Lots of control features. Easy to configure. A larger version would be nice. There are cheaper options available. 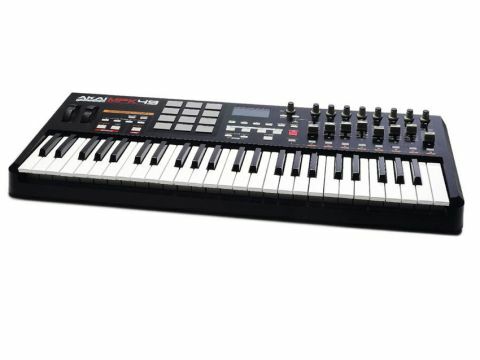 The MPK49 has that distinctive Akai 'look' about it. The keyboard can be bus-powered over USB. As you can see, the MPK49 is a ﬁne-looking fellow. A brief glance across its top panel hints at the range of control it offers, with the right-hand third offering eight 'endless' knobs, faders and switches. To the left-hand side, orange-illuminated pitchbend and assignable modulation wheels glow gently. Below the commanding blue backlit screen, meanwhile, a set of mode buttons ﬂanks the transport switches, which provide control over your sequencer. Most divertingly, the MPK features a set of 12 distinctive pads. These will be familiar to anyone with a working knowledge of Akai's product history: they're lifted from the MPC range of sampling sequencers. That's quite an impressive set of controllers, then, but appearances can be deceptive. As it transpires, while there's only one set of eight physical knobs, sliders and buttons, a Control Bank button lets you assign three different sets of data for these controls. So, rather than having 24 total parameters assignable to the MPK at any one time, you can have 72. This is enough to cover even complex plug-ins, and toggling banks to switch settings works well. In fact, from the moment you connect the USB cable, everything here does. Installation is easy, and Akai has created a bunch of presets to get you started. So, if you own Cubase, Sonar or Live or plug-ins from Spectrasonics or GForce, the MPK is ready straight out of the box. If not, assigning commands is very easy. The Edit button sets the screen a-ﬂashing and to set a MIDI controller, you simply push the knob, fader or switch of your choice and then pick the relevant controller number and range on the screen. So, if you want to adjust a plug-in's volume, you look up the MIDI controller number for that product and decide if you want to restrict full (0-127) controller movement. Repeat for as many parameters as you want and save the 'preset' to one of 30 locations. The MPC pads are similarly glorious in use. Functionally, they seems identical to those on the MPC500; they require a pleasingly ﬁrm thwack to get up to the higher velocities. If ﬁxed maximum output is all you require, the MPK helpfully offers a Full Level button, which restricts output to velocity 127. Another helpful feature is the '12 Level' button, which maps the most recently hit pad to all 12 pads and assigns a different ﬁxed velocity to each. Accordingly, repeatedly pressing a single pad triggers one sound at the same velocity, but there are now 12 'predictable' values from which to choose. Perhaps the standout features, however, arrive in the form of two 'sequence generating' modules. Firstly, the MPK offers its own arpeggiator, which can clock internally or from MIDI. You can edit arpeggiation type and range. Similarly, the Note Repeat button provides comparable performance via the pads, whereby any held pads will 'repeat trigger'. Both the Arpeggiator and Note Repeat are governed by the MPK's 'Time Division' control, which lets you specify a note resolution for playback. Both strict and 'swung' values are available. Like the MPK49, most MIDI keyboards now ship with myriad control options, but Akai's model still manages to stand out from the crowd. The faders and knobs offer an even, smooth response; assigning controllers is child's play; and the pads offer classic MPC-like performance. A full length, fully-weighted keyboard would be fantastic - and even for the serious hobbyist 49 keys may not be enough - but something tells us that Akai will address these issues in the future. In the meantime, here's a compact keyboard that's packed with features and performs superbly.